Hearing a doctor tell you that you have Bipolar Disorder can be one of the most overwhelming experiences of your life. If your thoughts weren’t racing already, those words will send them into high gear. Don’t panic. You can survive manic-depressive disorder and learn to live with it successfully. Bipolar gets a fair amount of negative press in the news and in TV and movie portrayals. The truth is, millions of people are living happy, productive lives with the disease. The key to most things in life is proper knowledge. The more you know about something, the better you can handle it. Mental illnesses are no different. To save you time, this article highlights the top 15 self-help books currently available for coping with Bipolar Disorder. Each book includes a brief synopsis of what you can find in the book. You can click on any book image to buy the book directly through Amazon. Curating a list of the top books for a subject like Bipolar Disorder takes much time and effort. With an open mind, each book was reviewed for clarity and content. The final list had to include only books that any patient could easily use and understand. Next, time was spent looking through customer reviews and testimonials. Last, sales history was considered as a book that sells a lot usually gives you some indication of its quality. All those factors were then combined into the following list. Life may have been a roller coaster in the months leading up to your diagnosis. Both your work and home life may be in disarray. It’s important to take back your life and put all the chaos in order. You can survive bipolar. Dr. David J. Miklowitz authored this guidebook, The Bipolar Disorder Survival Guide, and put his years of treating Bipolar and real patient experiences into the lifeblood of it. The Second Edition includes new sections, and the whole book was updated to current knowledge. Are there effective medications available? How should you respond when bouts of depression or mania arise? Should you tell your boss or colleagues about your diagnosis? If so, how? Sometimes you need a self-help book to be in the simplest terms possible. Bipolar can keep your mind spinning, so you don’t need to be putting a lot of effort into trying to read a book that may never make sense. Among other things, this book answers the question, what is bipolar depression? You shouldn’t be disillusioned by the name. Even though the title is, Bipolar Disorder For Dummies, the team behind writing the book spent much time properly researching the latest treatment options and statistics while writing and then revising this 3rd Edition. One thing that sets this book apart is the specialized details included on how bipolar might affect different groups including ethnic groups, expecting mothers and those advanced in age. To survive bipolar, it’s good to know that not every group responds the same way. This choice is an excellent option for both the bipolar patient and their friends or family members. Carefully thought out tips can help caregivers and significant others to develop the tools they need to handle the sometimes unpredictable course of changing temperments. Learn what signs to be watchful for and how to respond when those signs appear. Since the bipolar mind can be erratic and unpredictable, maintaining a relationship with someone who has been diagnosed brings its own unique challenges. Loving Someone with Bipolar Disorder has been specifically written to help significant others and family members to understand the illness. It also helps them to recognize the signs of bipolar disorder and to have the strength to ride the bipolar wave. Roadmaps are clearly laid out in the book to help you understand the triggers that lead to both manic or depressive episodes and how those triggers might be avoided. The validation provided in the book will help you to cope with the days where bipolar is most unreasonable. The best way to treat and survive bipolar is to have close family and friends involved in the treatment process. This book will help give you the skills you need to provide that help. Even if the patient tries to draw away during severe episodes, tips from its pages will help you to maintain a close bond. Next, many individuals live with bipolar for years before they are properly diagnosed. In that time, they may develop personalized coping skills to help them deal with the inevitable ups and downs associated with the condition. Some of these skills may be highly effective while others may not work well at all. Learn how to live successfully with your diagnosis with the tips in this workbook. Another option is The Bipolar Handbook by Dr. Wes Burgess which discusses real questions from real patients from his decades of treating bipolar patients. From symptoms to therapy, this book covers virtually every aspect of the condition. In addition, clear directions are laid out for preventing and coping with manic or depressive episodes. Putting the suggestions into practice will help you to live a healthy and productive life. How can you get bipolar under control? Which steps should be taken to get a proper diagnosis of bipolar depression symptoms? What should you look for when choosing a mental health professional? Living with bipolar creates unique challenges for everything from dating to maintaining friendships. Dr. Burgess addresses these struggles with useful tips on how to maintain close relationships. In addition, many other references are listed where the patient and family can get additional help with living with the diagnosis so they can survive bipolar. Mary Ellen Copeland is a best-selling author, and this is the Second Edition of her valuable workbook. She recognizes that the most crucial element for dealing with bipolar is positive and effective self-care. The Depression Workbook includes instructions for decreasing manic or depressive periods and for taking control of your own wellness. Like most chronic illnesses, effective care for bipolar disorder usually involves keeping a health journal. This book provides charts to make it easy to gauge and track moods and behaviors. In addition, many tips are offered throughout its pages for developing a healthy support system, finding the right mental health practitioners, and avoiding environments that can be episode triggers. Additional strategies for proper exercise, diet and rest are given. The Second Edition has a new chapter added that details a system for staying healthy and managing episodes. Wellness Recovery Plan (WRAP) is a process that was created by real patients living successfully with bipolar, depression, and other mental disorders. The validation and treatment plans will help to give you confidence in a positive future. Another stellar workbook, this one is specifically geared toward Bipolar II. If you are not sure if you have Bipolar I or Bipolar II, discuss this topic with your medical practitioner. For the most part, patients diagnosed with Bipolar II generally do not have the full-manic episodes that are distinctive in Bipolar I. A team of experts working crafted The Bipolar II Disorder Workbook for bipolar disorder treatment. The strategy set forth was formulated to better handle recurring mood shifts. The treatment suggestions found in the book draw on both dialectical behavior therapy (DBT) and cognitive behavioral therapy. Similarly, suggestions for measuring progress, controlling emotions, and living the best life possible are considered. Finally, this workbook stands out because it is the first one that was designed solely for patients with Bipolar II. If you are not sure which type of bipolar you have, you may prefer this workbook. When you are living with a mental disorder, it can be a struggle. However, there is no need to let it be your master. Author, Dr. Monica Ramirez Basco takes a look at the substance of the disorder. She identifies how to spot the changes in mood that are typically the alert for an oncoming episode. The procedures for coping discussed in this workbook include detailed activities that can help you track and understand where you are most vulnerable or strong. Additionally, the workbook will help you to determine what your individual triggers might be. The forms printed in the book can be easily downloaded and duplicated for future use. Each patient living with bipolar has their own unique story and strategies. The Bipolar Workbook will help you to develop your own best practices for making proper choices, overcoming issues, and controlling anxiety. Patient examples and vibrant experiences illustrate how to put your strategies into practice. William R. Marchand, a neuroscientist and psychiatrist, looks at the unique use of mindfulness for coping with bipolar in the pages of Mindfulness for Bipolar Disorder. Learning to be more aware in each moment or mindful is one of the most promising treatments for dealing with mental illnesses today. The telltale signs of bipolar disorder include periods or elation or increased energy (mania) followed by periods of intense sadness and depression. Left to their own, these major changes in energy and mood can make both work and home life difficult. In Mindfulness for Bipolar Disorder, you will see how to improve your life quality by learning to proactively address anxiety, stress, and depression. Marchand not only draws on his years in the medical field but also on his personal study of monks in the Soto Zen tradition. Manic-depression, as bipolar disorder was once known, has seen great strides in the effective treatment of the condition. Thanks has to be given to pioneering doctors like Ronald R. Fieve, MD. For more than 30 years, he has concentrated on providing the best treatment options for afflicted patients. Bipolar Breakthrough draws on his decades of first-hand experience. It lays out the best strategy for dealing with the polar extremes that are common with the disease and other manic depression symptoms. The focus is pointed at not only treating the symptoms but on maintaining the healthy periods between episodes. The book also benefits from the patient histories of hundreds of patients. Each patient helped to further pinpoint the best actions to take for a successful life. Part of the book is dedicated to specific patient groups including seniors, expecting mothers and adolescents. Mark Bauer and Linda McBride created the Life Goals Program (LGP), the backbone of this book. It helps those experiencing bipolar to take the reigns and control the disorder. In the past, some doctors took a passive approach to treatment. They waited to see how certain treatments worked before forming any type of proactive plan. This workbook helps put you on the offensive as you learn to examine triggers, beliefs, and cycles specific to your case. Overcoming Bipolar Disorder is the culmination of two clinical trials. During those trials, the writers got a better perspective on the illness and the most effective means of treatment. The book works to enlighten the patient on the best ways to recognize and cope with the triggers and cycles brought on by the disorder. Through the use of modules, this book helps the patient or family to understand how the condition can affect the body and why people may make unwise choices to self-medicate. Detailed steps are outlined to help you to make better choices and to put into practice the tools that will enable you to live the best life possible. Managing Bipolar Disorder: A Cognitive Behavior Treatment Program Workbook strives to give patients the skillset they need. This skillset will help them to be more stable and to get a better handle on bipolar cycles. The book is broken up into sessions that will instruct you on how to see where you want to be and how to get there. This book is designed to be used with a therapist for best results. The sessions are broken up into four main phases. Learn how to overcome the depression associated with bipolar. Create a plan to keep those around you informed on how best to help. Devise personalized methods of dealing with social interactions and mood control. Discover the best tips for keeping cycles in check. Learn to be prepared for issues that may come up in the future. Weight issues and bipolar disorder frequently walk hand-in-hand. The Wellness Workbook for Bipolar Disorder takes a unique approach to live successfully with bipolar by also including a plan for losing weight, controlling moods, and living healthier lives. The workbook lays out a diet that was researched by Harvard. When coupled with a healthy lifestyle routine, this can lead to better health, both mentally and physically. During a bipolar episode, it can be hard to make the right choices as to exercise and nutrition. This book helps you develop healthy habits that you will be able to continue even during the rough periods. For one of the simplest explanations of bipolar disorder and treatment plans, The Complete Idiot’s Guide to Bipolar Disorder presents valuable insight into the condition. Explanations are given as to how bipolar is different than other mental health conditions. In addition, chapters discuss how treatments can be best devised to keep the disease under control. The most recent treatment options are discussed along with sobering facts on the number of people living with bipolar. Finally, this workbook has been designed specifically to help teens that have been diagnosed with bipolar disorder. Being a teen can be hard enough as you are learning to cope with new feelings and experiences. Adding bipolar into the mix creates an array of unique challenges. The Bipolar Workbook for Teens sets out simple action plans to help maintain a stable mood and to stay focused on future goals. Emphasis is placed on learning to be fully independent and to live a life of balance and focus. The steps to formulate a support and crisis plan. Be sure to take some time to read through the different book descriptions as some have very different content. 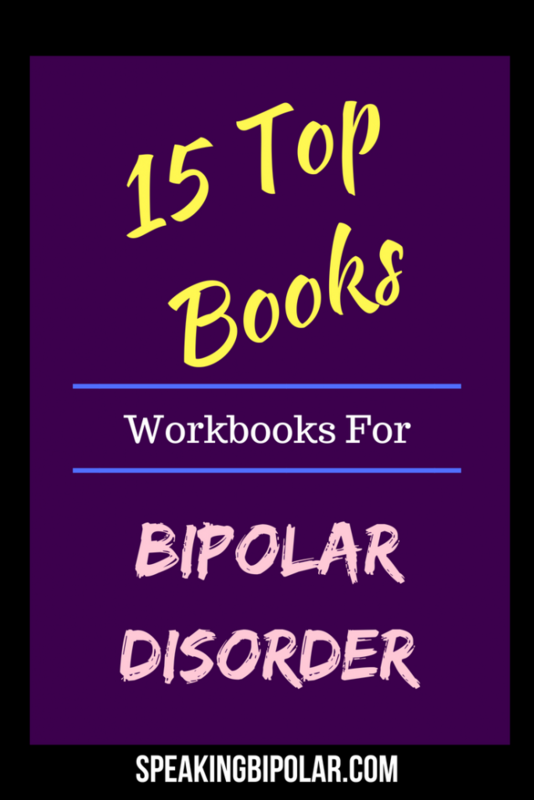 If you want something to work with as you learn to better live with bipolar, you may want one of the workbooks that include worksheets and lessons for practical learning. Instead, you may prefer to just read patient stories or doctor’s advice. If you have Bipolar II, you may want the book that was specifically written for that disorder. 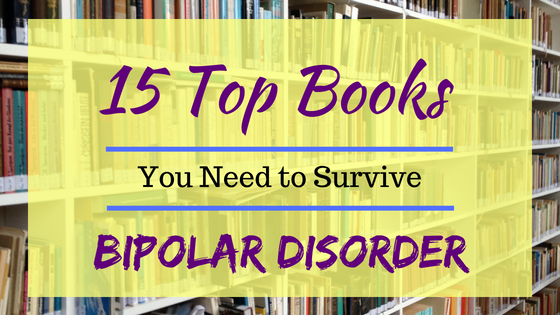 Overall, my favorite is The Bipolar Disorder Survival Guide. Not only does it give up to date information on treatment options and plans, it also is very helpful with how friends and family can help someone with the diagnosis. That said, I don’t believe you can go wrong with any of the books mentioned here. Whatever you are looking for, these books can help you to find the validation and skillsets you need to live successfully with bipolar disorder. We are all primarily responsible for our own health. These books will help you to take the control you might be missing. p.s. I should add that many men have read my book and they’ve found it useful for their own mood disorders (bipolar, anxiety, PTSD) and also for helping them understand their partners who live with these conditions. I would reblog this article but there is no facility to do that. Hi Daniel, Thank you for your comment. From what I understand, the reblog button doesn’t show since my site is not hosted by WordPress.com. You can copy the link to the page you want to share and paste it in a new blog post to do the same thing. Hope that helps. Thank you for taking the trouble to pull this list together. You are very welcome. I hope you find something you like. Be sure to come back and let me know.